In a world where so many people don't believe that the rules apply to them, Disney has had enough. 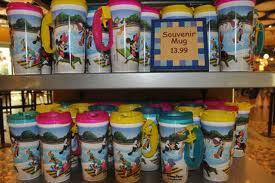 Disney's "Refillable Mug" is one of the most abused benefits of staying at a Walt Disney World Resort. It used to be that Disney had mugs with the design of each resort, but then you couldn't tell how old these mugs were. Disney then started to change the mugs from year to year to discourge those that weren't following the rules. On the side of these mugs Disney has printed, "Refills available at no additional charge at Resort Beverage Islands located in the resort that this mug was purchased through the end of your resort stay." This rule gets broke by people reusing them and by using them at other resorts. Disney has had enough. New mugs are currently being tested at Disney's All Star Sports's World Preieme Food Court. This new system is set up to tell when the end of your stay is, so on return visits you can only use it to get ice and water. Apparently, the RFID system also knows how much fills one mug and will only dispense that amount every five minutes. Making it even more difficult to find a way around the system. What do you think of Disney implementing this new RFID system? Do you have a lifetime mug, if so how do you think Disney is going to handle people who purchased them? About fraking time. I've even seen idiots stick their heads under a dispenser. Once the new year rolls around the RFID chip will be linked to your room reservation. Sounds like a plan. I'm sure anyone who has a Lifetime mug will get a new one with an RFID in it. Likely it activates upon check in and deactivates upon check out. I will not be purchasing one of these RFID mugs, if they, in fact, begin to use them. While I understand that it is "against the rules" to reuse these mugs on return visits, it seemed to be an unspoken allowance of sorts. I think Disney really needs to provide return visitors with some sort of benefit/incentive for customer loyalty...and there must be such a minuscule cost to this....rather than spend the time/money on creating these RFID mugs, maybe they could actually ALLOW visitors who actually spend more of their vacation dollars on these return visits, to legitimately USE these refillable mugs. I am thrilled - this has been a pet peeve of mine for years!